There's no secret to Cheryl Lundy's success as a teacher of Textiles. She's so open about it that she holds seminars to share it. Teachers also travel from across Western Australia to visit her at MLC to see how she does it. 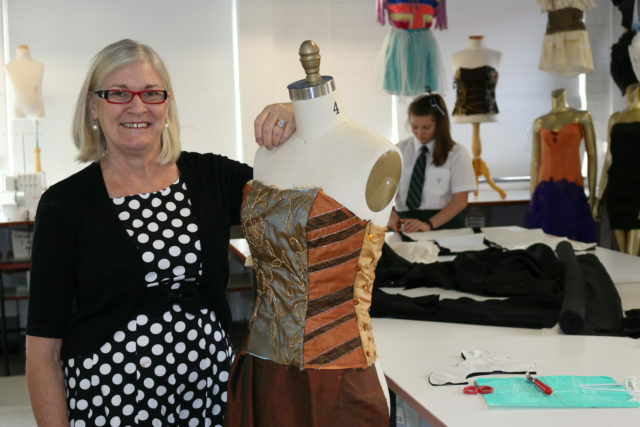 For the past five years, the top student in Materials Design and Textiles in WA has been through Mrs Lundy's course. "I've set up a network of home economics teachers to share assessment tasks and how to put together a folio, so it's not a closely guarded secret," Mrs Lundy said. She says her approach to building on excellence is the key to her success. "I always maintain an excellent folio from the previous year and have that available for students to see. They can use information from looking at that, and are able to model on presentation ways or the depth of answers that are given. "They can write for their own folio work and their own task work at that kind of level. Building on what we've done in previous years has helped to maintain the award." Mrs Lundy admits that not everything can be shared. She has an intimate knowledge of the course that she helped develop nine years ago as part of the course advisory group, action research panel, and the exam working party. She also supplied work samples to the curriculum council as benchmarks for grading portfolios. According to her students, however, it's Mrs Lundy's infectious delight for her subject that draws them in and inspires them to produce award-winning designs. The 2014 Course Exhibition winner, Kathy Hsien, said her first impression of Mrs Lundy was of a "passionate and pleasant" woman who ignited her creative mind. Mrs Lundy, on the other hand, gives the credit for the College's success to the hard work that the students put into it. "A lot of students choose to do the course because they enjoy it, and if they are passionate about it they'll put in the hard yards because they're having so much fun," she said. The course is attractive to girls study WACE and VET courses. Among the students that have excelled are girls who have been dux. The ethos of working together for all to succeed is instilled from day one. Mrs Lundy's interest in fashion and textiles began as a young girl growing up in the town of York in the Wheatbelt region of WA. Her mother was the fashion buyer for the local co-op, and she was a natural artist. A young Cheryl went to boarding school in the town of Northam, where she thrived. She won numerous art prizes, and took out four subject prizes in her final exams. "I had two art teachers that I just adored through my schooling. I always had an interest in crafts and art, and I've transferred that into working in textiles," Mrs Lundy said. After high school, young Cheryl decided to become a primary school teacher, but at her interview to go into teaching she was asked to consider becoming a Home Economics teacher instead. "I just changed my mind right there on that spot, on that day and decided to do Home Economics teaching. I've never been sad that I did that. I've always been really pleased that I made that choice because I've learnt a bag full of life skills doing Home Ec. teaching." The mother of two and grandmother of three began her career at MLC 14 years ago as a teacher of cooking, and Independent Living, a subject she describes as "wishy washy." "About 10 years ago we started a textiles-based course for Years 11 and 12 but it was not a Tertiary Entrance Exam subject. It's really only been six years that we've had the TEE course and now it's buzzing here," said Mrs Lundy. "In my class I want them to develop some life skills, I want them to feel valued in the work they do. I want them to reach their potential and be successful in whatever they're doing. "The majority of girls do Textiles because they love it, and go on to do Medicine, Dentistry, Engineering or Law."